Ryobi don't stray much into machine territory, preferring to stick with powertools. However this compact site unit looks like a decent piece of kit, question is does it live up to its looks? The table surface is a textured coated aluminium and seemed pretty flat and reliable. There is a pull out work support at the back of the machine and a pressed steel sliding section to the right hand side which when fully out gives a massive effective surface area for panel cutting. The body of the table is tough plastic with various moulded details that give it some of its functionality such as the rest for the table fence when not in use and place for a spare blade. The fence runs the full length of the table, it has an attachable L-shape extrusion which makes planing thin sections easier and Allows rear offset when ripping solid timber to relieve pressure if the timber twists. The fixed scale on the table is set for the fence on its own not with the L-piece added. The mitre fence is well made, has clear markings and can run in one of two slots on the table. It is fully adjustable and will take an add-on sub fence. It can be folded down, still attached but the wheels and the uppermost legs make it highly manoeuverable rather like a hand cart. 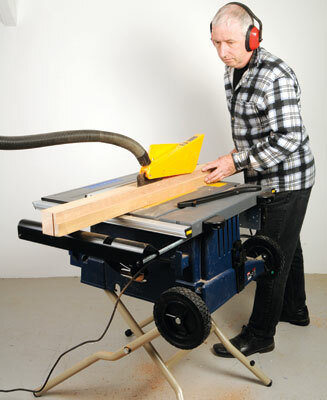 The motor as is usual on lightweight saws is a direct drive type without a pulley to increase torque at the blade. The crown guard has an extraction port and usefully has a lift up guard section on the fence side for extra protection. Three surprises really, one the setup wasn't 'tinny' when running, two the motor wasn't unduly noise or 'bright' as is often the case and three it had plenty of power to cut deep timber without stress or slowing the motor. The long fence needs to be set correctly to avoid accidental 'toe-in' or toe-out' but this is no different to any other saw in this class. I liked this tablesaw for several key reasons. It had power and accuracy. It didn't feel cheap and it didn't complain under load. Being able to fold it down and wheel it around was really useful although standard doorways are a challenge that requires moving through sideways. Overall this machine has quite a few clever design features and it does the job expected of it. 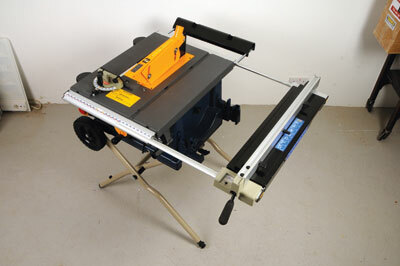 A worthwhile acquisition for site or home workshop if you don't want a big static tablesaw. "This machine has quite a few clever design features"